The experts point out that food contaminated by bacteria, viruses, parasites, or harmful chemicals causes over 200 diseases, from diarrhea to cancer, and people should pay close attention to facts such as expiration date, food preservation, etc. 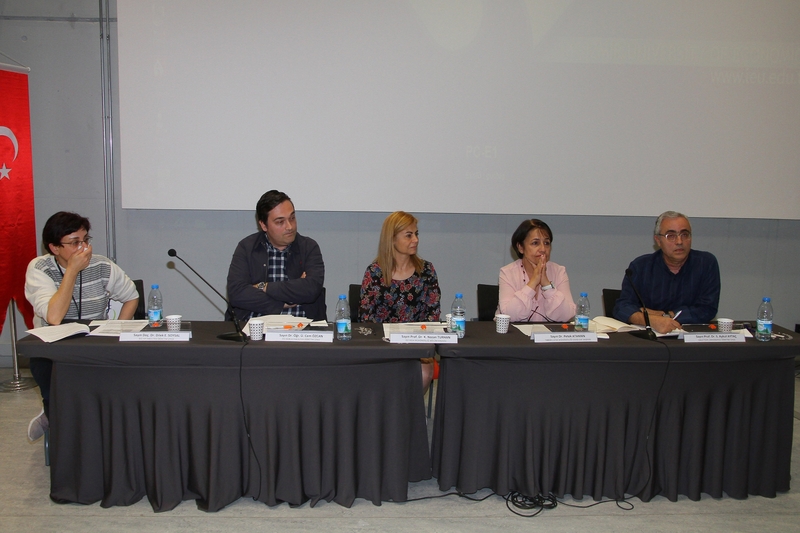 Department of Food Engineering, Faculty of Engineering, Izmir University of Economics (IUE) held "Food: Nutrient or Poison?" titled panel. Prof. Dr. Nazan Turhan, Head of IUE Department of Food Engineering, moderated the panel. Petek Ataman, Former Chairman of the Chamber of Food Engineers, UCTEA (The Union of Chambers of Turkish Engineers and Architects), Prof. Dr. Aykut Aytaç, Faculty Member from Department of Food Engineering, Hacettepe University, Assoc. Prof. Dilek Soysal, Faculty Member from IUE Faculty of Medicine, and Asst. Prof. Cem Özcan, from IUE Faculty of Law, attended the panel as guest speakers. Prof. Dr. Nazan Turhan, Head of IUE Department of Food Engineering, pointed out that food safety, consumption of safe foods, and control mechanism were all connected to each other. Turhan said, “The microorganisms that cause food poisoning need certain nutrients, temperature, water in order to grow and reproduce, and some of them even need oxygen. Under the right conditions, one bacterium could become a billion bacteria in just 12 hours. Studies on foodborne illnesses show that they cause kidney failure, reactive arthritis, malfunctions in the brain and nervous system in the long run”. Petek Ataman da, Former Chairman of the Chamber of Food Engineers, pointed out that the consumers were the last and most significant loop of the food safety chain. Ataman said, “Consumers should purchase products from registered, certified businesses. These are very important principles. They both point to packaged goods. Packaging protects the products and stops them from getting contaminated and going to waste”. Asst. Prof. Cem Özcan from IUE Faculty of Law indicated that only one supervisory authority should lead hygiene and food safety. Prof. Dr. Aykut Aytaç, Faculty Member from Department of Food Engineering, Hacettepe University, stated that the penalty for adulterated food should be much higher than the economic profit obtained from fraud. In addition, Asst. Prof. Dilek Soysa from IUE Faculty of Medicine reported that serious health issues might await us when necessary precautions regarding food safety are not taken.